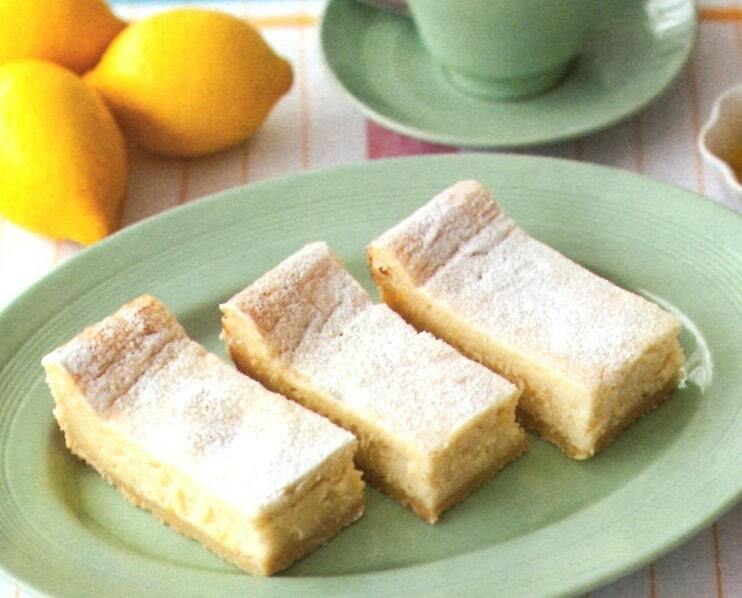 These soft lemon filled slices are tart and tangy with a buttery biscuit base that makes this recipe very moreish indead! Dusted with icing sugar they make a great tea time treat. Preheat the oven to 170 C/150 C fan/gas mark 3. Grease a 20x30cm deep non-stick baking or roasting tin and line the base with baking paper. For the base, place the butter, sugar, flour and milk in a food processor and blend until the mixture resembles breadcrumbs. Press the mixture down well into the prepared tin and bake for 20 mins until golden. Prepare the lemon topping while the base is baking by whisking together the condensed ilk, ream, sugar and eggs in a large bowl. Add the lemon zest and juice, then the flour and whisk until smooth. Remove the base from the oven and pour in the lemon mixture so the base is completely covered. Return to the oven and bake for 35-40 mins until the top is set and lightly browned. Allow to cool completely before slicing into bars and removing from the tin. Use a hot sharp knife to ensure a clean cut and store the bars in an airtight container.